Preparations are underway for a wonderful family vacation this summer. But I’ve had an unwelcome visitor in the process this year. Flight anxiety. This isn’t your garden variety flight anxiety — worrying about the plane crashing to earth (I definitely have that one though). This is a fear of bringing my peanut-allergic son onto an aircraft and seeing him experience a life-threatening reaction 35,000 feet up in the air. Over the Pacific Ocean. Hours away from an emergency room. Have you had these fears, too? Twitter. That (relative) state of calm has been shattered since I signed up for a Twitter account in the past year. I’ve clicked on links to read heart-wrenching accounts of anaphylaxis. Tearing up as I read them, I’ve mentally noted the varying descriptions of how anaphylaxis presents itself. We’ve never had to give our son epinephrine. He did receive it at diabetes camp once, years ago. Aside from that traumatic incident, the Epis have been dutifully carried around in my son’s bag without use for over ten years. Since we have never administered Epinephrine ourselves, it’s easy to feel somewhat complacent. Will I recognize the signs of an allergic reaction should an emergency occur? We’ve all heard the pleas from medical professionals and parents who have been through this experience: Don’t hesitate! Give the Epi-pen or Auvi-Q shot! 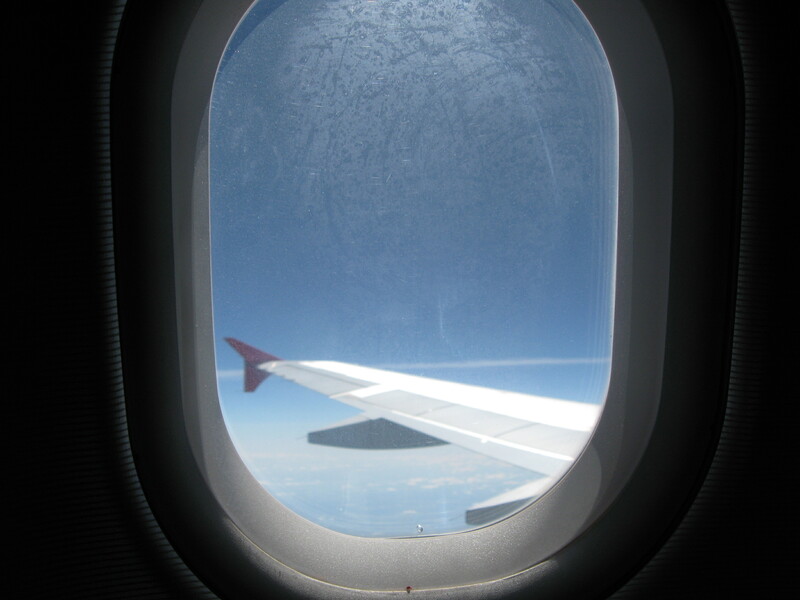 So in the spirit of facing my fears and avoiding complacency, I have returned to news articles, videos and posts from the past year or two about food allergic passengers’ negative experiences with airline travel. I was determined to be fully informed! In doing so, I came across recommendations detailing steps to take to make airline travel as safe as possible. It was reassuring to review them. Especially since we had been taking most of these steps over the years. But I also encountered stories that made heart race. Descriptions of conflicts between food allergic passengers advocating for their needs and the reluctant airline crew who would not accommodate them — infuriating! And the couple of accounts of in-flight anaphylactic reactions to nuts despite precautions having been taken? Absolutely terrifying. The culmination of my anxiety came when I watched the five minute film: More Than an Inconvenience by Amy Wicker. She is a food allergy advocate and author of the site Allergy Safe Travels. In this film, seven individuals / families tell their stories of adversity flying with a life-threatening nut allergy and experiencing a reaction or deciding not to fly at all because of it. My heart aches for all of these families — and ourselves included. We simply want our children to be safe! Okay, at this point my anxiety was absolutely off the charts. The data is reassuring — and also somewhat alarming! Essentially, in the study listed above, the authors analyzed in-flight emergency data from a 2 year, 10 month period. There were about 16 medical emergencies per 1 million passengers. “Allergic reaction” (food allergy wasn’t specified) was responsible for only 2.2% of the emergencies (265 people). That’s pretty low! The plane was diverted for 12 of the 265 emergencies. Forty passengers with allergic reactions were transported to the hospital for evaluation and eight were admitted. And there were no deaths from allergic reactions. Not one. Thank God. 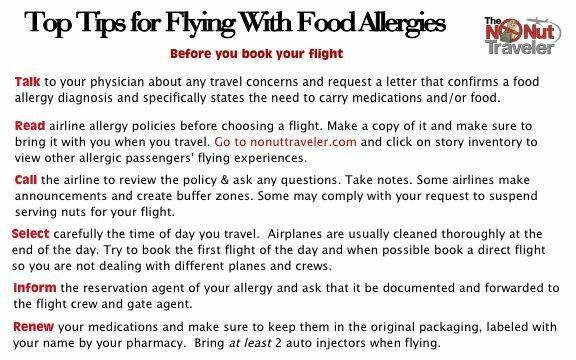 But then in an international study about flying with nut allergies, led by the University of Michigan, published in the Journal of Allergy and Clinical Immunology – In Practice and listed on the C.S. Mott Children’s Hospital website, they reported that only 50.1% of the passengers who experienced an allergic reaction informed the flight crew about it. What? So the emergency data above likely does not accurately reflect the amount of allergic reactions that are occurring? Just over 10% of the study participants with life-threatening nut allergies reported having an in-flight allergic reaction. That’s a lot! Not every participant took precautions. If fact, not everyone carried epinephrine. And of those who experienced an allergic reaction, only 13% used their epinephrine. The preventative measures listed above are encompassed in these great guidelines, provided by No Nut Traveler. Okay, so our family trip is definitely still on. Reviewing the recommendations above helps me gain a much needed perspective on this situation. It’s so easy to feel your anxiety level skyrocketing when reviewing all of this information! The antidote to anxiety: Information and action. Follow the recommendations above from No Nut Traveler — including talking to your doctor. 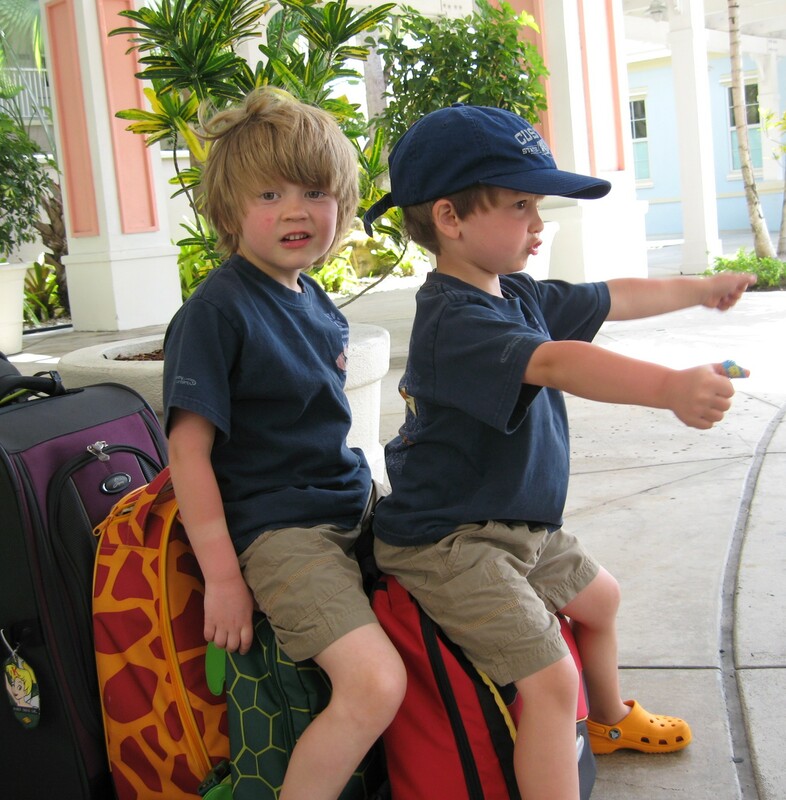 Does your allergist think airline travel is appropriate for your child? Are you prepared to give epinephrine, should it be needed? F.A.R.E. has a great anaphylaxis plan that could be helpful. You’ve taken action to minimize risks by following the recommendations above. Time to get through those flights and enjoy that vacation! 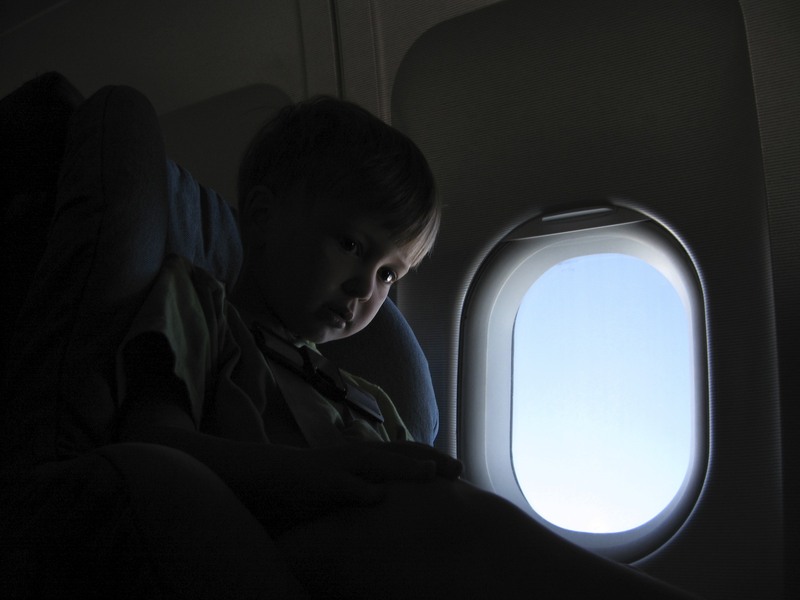 Anxiety is a part of the package if you’re flying with a child who has a life-threatening food allergy. Be aware of it — but don’t let it rule your life. My anxiety is probably going to be in the “elevated” state after all of this research. Alert. Vigilant. If it goes off the charts, my child will take notice and follow suit. Yours may, too! Our children are watching how we navigate this difficult situation and determining whether or not it’s safe to go out into the world. What do you want want your child to learn? Finally, there’s one way to minimize — if not end — this anxiety roller coaster for all families affected by nut allergies. ADVOCATE! 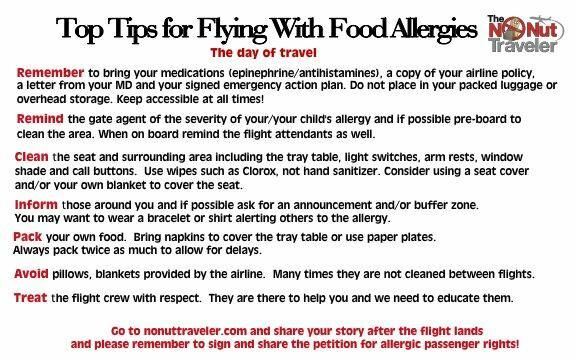 Sign Lianne Mandelbaum’s petition, asking for a bill of rights to be instituted for passengers with life-threatening nut allergies. The deadline is coming up at the end of June and more signatures are needed. Watch and share More Than an Inconvenience, as mentioned earlier. If you or your loved one has been impacted negatively by airline policies, please share it with your local media. Join Food Allergy Resource & Education or another advocacy organization to keep abreast of the issues! Really helpful advice, and well written. Thank you for writing it!